What would you call the new Led Zeppelin? Led Zeppelin. The very name seems larger than life, conjuring up images of sold-out stadiums packed with fans in thrall of the crushing sound of the hammer of the gods - that is to say the cosmic force put out by Robert Plant, Jimmy Page, John Paul Jones and John Bonham. If (or when) the 'band' tours next year, however, there'll be a replacement Bonham behind the drumkit (the late John Bonham's capable son Jason), and no Plant at the mic (no word on his replacement yet). 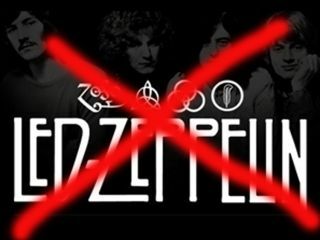 Oh, and they won't be calling themselves Led Zeppelin. They can't. In recent months, Robert Plant has repeatedly stated that he has no desire to take part in a 'reunion tour,' his golden god ego having been satiated by the band's one-off performance at an Ahmet Ertegun tribute concert at London's O2 arena in December 2007. At age 60, Plant is done with it. Finished. He's gotten the Led out and successfully reinvented himself as a pop-country-bluegrass singer with singing partner Alison Krauss. The two plan to record a new album with producer T Bone Burnett, starting in January 2009. While Plant did give backhanded "everyone's got to eat" blessing to the band touring without him, he also dealt a five-finger death punch to the use of the well-branded name when he said, "But they won't be calling it Led Zeppelin." Which puts Jimmy Page in a bit of a spot. Not only does he have to come up with a replacement vocalist who will do no damage to the Led Zep legacy - lists have been bandied about, the consistent contender being Alter Bridge's Myles Kennedy - but he has to name this group something. Something good. Something powerful. So, the big question is this: What would you call the 'new' Led Zeppelin? Got a name? Let's hear it. And no, The New Original Yardbirds won't count - we already thought of that one. But what else? Led Astray? Dead Zeppelin?